There are plenty of legends and urban myths about the Monkees, ranging from Liquid Paper to Charles Manson. But do you really know which is which? It’s true Monkee Michael Nesmith’s mother invented Liquid Paper. It’s true Stephen Stills auditioned to be on the show but was rejected over a receding hairline and bad teeth. It’s an urban legend that Charles Manson auditioned. He was in jail. Monkee Business pulls out plenty of stops. There have been dozens of books written about the band. But in Monkee Business: The Revolutionary Made-For-TV Band, author Eric Lefcowitz pulls it all together from the group’s casting call beginnings to their touring schedule today. He starts at the very beginning, with Bob Rafelson and Bert Schneider and their Raybert Productions. Some people say the concept was a made-for-television knock-off of The Beatles’ A Hard Days Night movie. But Rafelson always claimed his concept for what would become the show The Monkees predated it. Whether or not that is true, the duo did have a carefully crafted plan, which included auditioning actors and musicians to create a specific mix of characters. They settled on two of each: actors/entertainers Davy Jones and Micky Dolenz and musicians Peter Tork and Michael Nesmith. Rafelson and Scheider were very adept at marketing. Before the first show ever aired, they released several singles by The Monkees. As soon as they hit the airwaves, the songs created a buzz for the show’s debut. It all paid off. The show and record combination made Monkees albums outsell the Beatles. The show also earned two Emmy Awards. We recently found a rare clip of the original opening for the pilot. As noted on the video, Tommy Boyce and Bobby Hart sang on this clip. When the show aired, the Monkees took over with more energy and antics. The secret to their success was kept under wraps. As more and more success was lavished on the Monkees so was increased media interest. And this is where Rafelson and Schneider made their fatal mistake. They wouldn’t allow interviews for fear that the media would discover that the “band” had been prefabricated. To make matters worse, the band didn't play the instruments on their debut record. (They did sing and Nesmith did write and produce some songs.) Back then, and sometimes today, it isn't uncommon. Not all bands play every instrument on their records. But there was one difference between the Monkees and groups like Sonny & Cher. That latter never implied that they played every instrument. The Monkees looked, acted, and played like a band. For all their efforts to keep the prefab beginnings under wraps, musicians Nesmith and Tork eventually raised hell and demanded more creative control over the music. That's when the damage was done. Nesmith offered up scathing comments in an interview about being shut out musically. Their cover was blown forever. The Monkees arguably proved they had more talent than anyone might have imagined, even Rafelson and Schneider. There is some poetic irony in that fact, given that had the Monkees had less talent nobody would have cared. And today, people don't care so much because, regardless of the initial fallout, the Monkees did capture the innocent side of the late Sixties and perhaps early Seventies. A nod to the author for an expose on egos. Lefcowitz, a self-described Monkees historian who began writing in the early 1980s, released his first book The Monkees Tale in 1985. MTV exposure helped make the book a best seller, launching his career. He does a fine job with the book and with the facts, but loses some credibility with spotty editing (typos), an increasingly common problem in publishing today. Where he does a nice job, however, is in exposing the personalities and egos of the four Monkees, including grabs for the limelight. The show ended, but the band played on. At least, it did until only two Monkees were left standing. Then, in 1980, Nesmith had his breakthrough concept for a music video show called Popclips, giving birth to MTV. The real payback comes from a rebirth of the Monkees on the ideal Schneider, ironically, helped push forward. In 1986, MTV ran a marathon of back-to-back The Monkees episodes, exposing the band to new fans and pushing seven of their albums back on to the Billboard charts. Pretty amazing. Monkee Business By Eric Lefcowitz Chimes In With A 3.8 On the Liquid Hip Richter Scale. Along with Monkee Business: The Revolutionary Made-For-TV Band, there are some other artifacts worth mentioning. Rhino Entertainment has one of the best collections on its Monkees Music Box, complete with a reissue of the original albums along with tracks from the reunion. The best of it includes Of You, an ultra-rare 1966 mix. Other artifacts include a U.S. flag screen print and Monkees giclee canvas print signed by Micky Dolenz (limited to 100). Wolfgang's Vault has vintage Monkees posters, crew passes, and memorabilia too. Of course, Dolenz, Tork, and Jones continue to perform solo and together. Tour dates are listed on the site Monkees.net. Author Lefcowitz contributes the occasional article there as well. Nesmith also continues to explore multimedia on his own via VideoRanch. 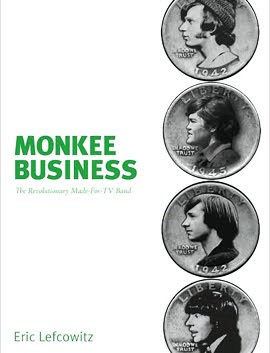 Monkee Business: The Revolutionary Made-For-TV Band is on Amazon and the Monkee Business Nook book can be found at Barnes & Noble.